Product Availability: In Stock. Orders normally ship same day if ordered by 3:30PM Est. Lens Type : 1-2 week disposable soft contact lenses. Package Content : 6 soft contact lenses in sterile buffered saline solution with 0.1% polyvinyl alcohol. 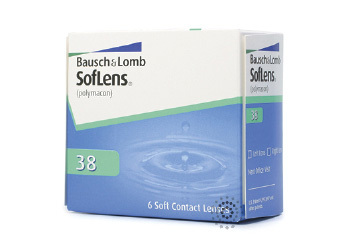 SofLens® 38 contact lenses, manufactured by Bausch & Lomb in a 6 pack format, are monthly disposable lenses that provide superior oxygen flow and comfort to your eyes. SofLens® 38 is made of polymacon, a durable material that resists protein build-up and provides all-day comfort and crisp clear vision. SofLens® 38 is perfect for a first-time contact lens user and people who lead an active, demanding lifestyle. These lenses are tinted for ease of handling, but will not change the color of your eye. SofLens® 38 contact lenses are designed to be worn as a two-week or monthly wear lenses. This means that you must take the lenses out each night and reuse after disinfection for up to 30 days after which you can simply discard and replace with fresh lenses. Be sure to follow your eye doctor's recommended replacement schedule.